The 12 boys and their soccer coach who were recently rescued from a cave in northern Thailand have appeared in video messages from their hospital beds, in which they each thanked officials and well-wishers for their help and support. Add Thailand Cave Rescue as an interest to stay up to date on the latest Thailand Cave Rescue news, video, and analysis from ABC News. Clad in patient gowns and surgical masks, the boys sat up in their beds at a hospital in Chiang Rai province as they individually gave brief statements, filmed Friday and released by officials at a press conference Saturday. Adul Sam-on, 14, delivered his in English. "Hello, I am Adul," he said to the camera. "Now, I am very fine. I am very thank you for help me. Thank you so much." The other boys, who spoke in Thai, echoed Adul&apos;s sentiments of gratitude and joy, and mentioned which foods they look forward to eating. "I am healthy," said Panumas Saengdee, 13. "Thank you for worrying about us and coming to help us. Don&apos;t worry anymore. I am safe now." "I want to eat [crispy pork belly stir fry]," said Pornchai Kamluang, 16. "Thank you everybody who support us and who send us inspiration. We want to thank you." "I am healthy," said Sompong Jaiwong, 13. "I want to eat [stir-fried pork with basil and fried egg]. I want to thank you everybody who give us support and everybody from all over the world who come to helps us. Thank you." The boys&apos; 25-year-old coach, Ekapol Chanthawong, gave his thanks to doctors, the Royal Thai Navy and the prime minister. "Now, I am healthy like normal, can eat normal," Ekapol said in Thai. "Thank you [everyone] who support us and every ministry that help me." Members of the "Wild Boars" football team at a hospital in Chiang Rai, Thailand in a photo released by the government. 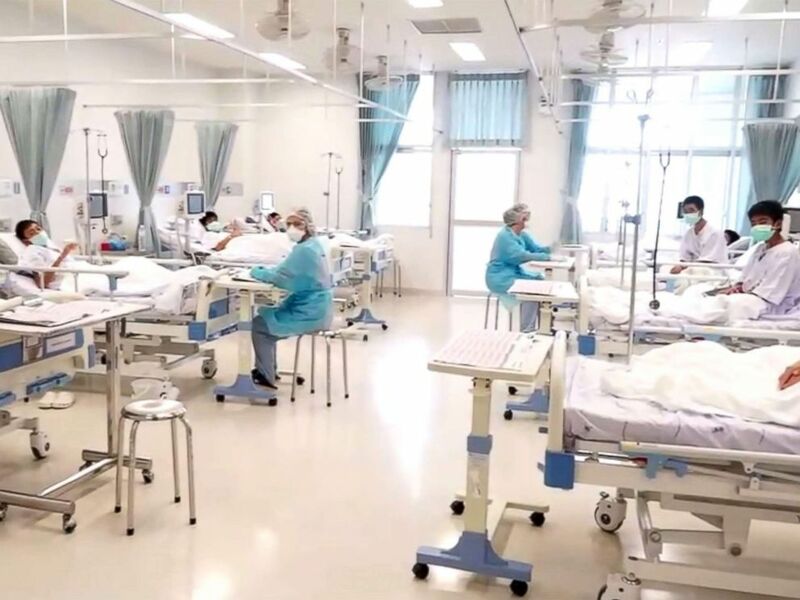 Officials at Chiangrai Prachanukroh Hospital told reporters at Saturday&apos;s press conference that all 13 are tentatively scheduled to be discharged Thursday. Thailand&apos;s public health minister, Piyasakol Sakolsatayadorn, said the group is "physically active and healthy." Some of the boys lost as much as 11 pounds during their ordeal. Now, a majority of them have each gained 4 pounds since being rescued. "Everyone is healthy, no fever and strong," Piyasakol said in Thai at the press conference Saturday. "They all have a good appetite and want to eat so many kinds of food." Piyasakol said family members no longer need to wear surgical masks when visiting the patients and can now stay at their bedsides, rather than being kept at a distance -- a protection against infection which doctors instituted in the first days after the group was hospitalized. Blood tests results showed no signs of infectious diseases that they might have contracted during their weeks stranded deep within a partly flooded cave near the village of Pong Pha. The group must complete a seven-day course of antibiotics prescribed by doctors, according to a statement released Thursday by Jedsada Chokdumrongsuk, permanent secretary at the public health ministry. Thai rescue teams walk inside cave complex where 12 boys and their soccer coach went missing, in Mae Sai, Chiang Rai province, in northern Thailand, July 2, 2018. The examining psychiatrist has reported that all 12 boys are in "good mental health condition," but there&apos;s concern about how the boys will fare when they return home for the first time in weeks, according to Piyasakol. The boys and their families have been instructed to avoid all media exposure for at least one month after they are discharged, out of fear it could trigger post-traumatic stress disorder symptoms. "The relatives need to take care of themselves and the boys. Everyone has to understand," the health minister told reporters, "even though the boys [will be] released from the hospital in a few days, they are still not strong enough and need to rest at home." The concerns also extend to the boys&apos; coach, who led the Wild Boar youth soccer team into the cave last month and has received criticism from outsiders. The boys and their parents, however, have generally praised the coach for keeping their spirits high and deferring food to them. Ekapol has gained back weight quickly and is physically well, but he is the one psychiatrists are most concerned about protecting from any mental angst, according to Piyasakol. After the patients are discharged, the hospital will deploy its "family care team" to follow up and help care for them until they make a full recovery, physically and mentally. The boys, ages 11 to 16, and their coach became trapped inside Tham Luang Nang Non, Thailand’s longest cave, during a hike June 23. The cave&apos;s 6-mile-long labyrinth of chambers and passageways stretch all the way into neighboring Myanmar. It’s believed the coach often took the teammates into the cave&apos;s main entrance in Khun Nam Nang Non Forest Park for fun excursions after soccer practice. Two boys who are part of the team but were not present for ill-fated hike told ABC News that going into the cave was a sort of rite of passage and team-building exercise. But as the group ventured deeper into the cave that afternoon, the sky opened up and it began to rain. The downpour sent floodwater rushing into the mouth of the cave and cut off their exit route. The group forged ahead until finding a dry, raised slope where they remained stranded in total darkness for days. After they didn’t return from their hike, Thai officials launched an extensive search-and-rescue operation involving well over 1,000 people, including specialists drafted from various nations such as Australia, China, Japan, the United Kingdom and the United States. Persistent rain initially impeded efforts to locate the group. But two British divers found all 13 alive on July 2 in an area a couple of miles from the cave’s main entrance. Four days later, a former member of the Royal Thai Navy, Saman Gunan, 38, died in the cave after losing consciousness underwater during an overnight operation delivering extra air tanks. A team of Royal Thai Navy members, a doctor and a nurse stayed with the group, giving them high-powered protein drinks and medical assessments, while rescuers worked on a plan to get them out as safely and quickly as possible. They fought against mother nature to pump out floodwater and divert water flows amid Thailand&apos;s wet monsoon season. International dive teams evacuated the boys four at a time over a period of three days earlier this week, racing against time and an impending monsoon rainstorm that threatened to inundate the cave again. The coach was the last to be evacuated. 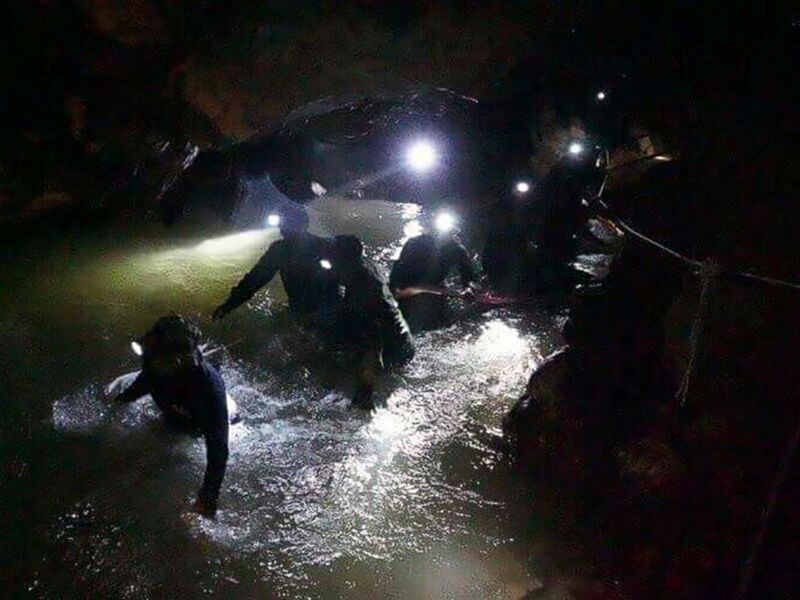 Nineteen divers entered the cave complex during every rescue mission. One to two divers guided each of the boys out, using tethers, through a winding, partially submerged series of caverns and corridors. The first leg of the days-long mission took 11 hours to complete on Sunday, while the second on Monday and third on Tuesday each took about nine hours, according to Chiang Rai provincial acting Gov. Narongsak Osatanakorn, the official in charge of the extensive search-and-rescue operation. Upon emerging from the cave on stretchers, the boys and their coach were whisked away in ambulances to Chiangrai Prachanukroh Hospital, where they have been recovering from the perilous experience and a variety of minor ailments. ABC News&apos; Brandon Baur, Joohee Cho, Matt Foster, Ben Gittleson, Matt Gutman, Hugo Leenhardt, James Longman, Kelly McCarthy, Matt McGarry, Gamay Palacios, Kirit Radia, Rex Sakamoto, Scott Shulman, Mike Trew, Anthony Trotter, Sohel Uddin, Marcus Wilford, Karson Yiu and Robert Zepeda contributed to this report. Published on Sat, 14 Jul 2018 06:46:00 GMT, © All rights reserved by the publisher.